Editor's Note: Melody Y. Hu is a writer for the Harvard Crimson, the leading news source for Harvard University. This article was brought to CNN.com by UWIRE, the leading provider of student-generated content. UWIRE aims to identify and promote the brightest young content creators and deliver their work to a larger audience via professional media partners such as CNN.com. Visit UWIRE.com to learn more. 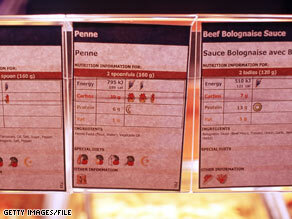 Nutritional labels like these seen at the Olympics can help students break down what they are eating. (UWIRE) -- After students and parents raised concerns about displayed calorie counts leading to or worsening eating disorders, Harvard University Dining Services removed the index cards detailing nutritional information from dining halls this year. Dining Services spokeswoman Crista Martin said several students and families asked the university to consider the effect of making detailed nutritional information known to students. "The feeling was that for people who have eating disorders or who struggle with issues around the literal value of food, the emphasis on nutrition information does not always lead people to eat in a healthy manner," Martin said. A committee of representatives from Dining Services, the Bureau of Study Counsel, Harvard University Health Services, and the College met over the summer to discuss the issue. "The decision was made that we needed to review the policy based on some of the inquiries from students, the concerns about eating disorders, and what we were doing to support those students in the dining hall," Martin said. Executive director Ted A. Mayer said on the Dining Services blog this week that the office needs to address "the challenge a quiet and surprisingly large contingent of our community faces with eating disorders." "Those individuals can place an undue emphasis on calories and other literal food values, making their placement over every food item a real challenge," he wrote. "We did what we felt best addressed the special health needs of those individuals." Though the nutritional information -- which included number of calories, serving size, grams of fat and grams of carbohydrates -- is no longer displayed alongside the food, students can still look up the nutritive analysis on the Internet or in kiosks in the dining halls. In addition to making nutritional information available at the kiosks, Dining Services will continue to promote healthy eating among students through forums and information session, Martin said. "We are talking about the benefits of foods as opposed to talking about their literal caloric breakdown," she said.